Enterprise Architect's user interface consists of a range of high-impact windows, menus and toolbars that you can arrange to suit your work methods. 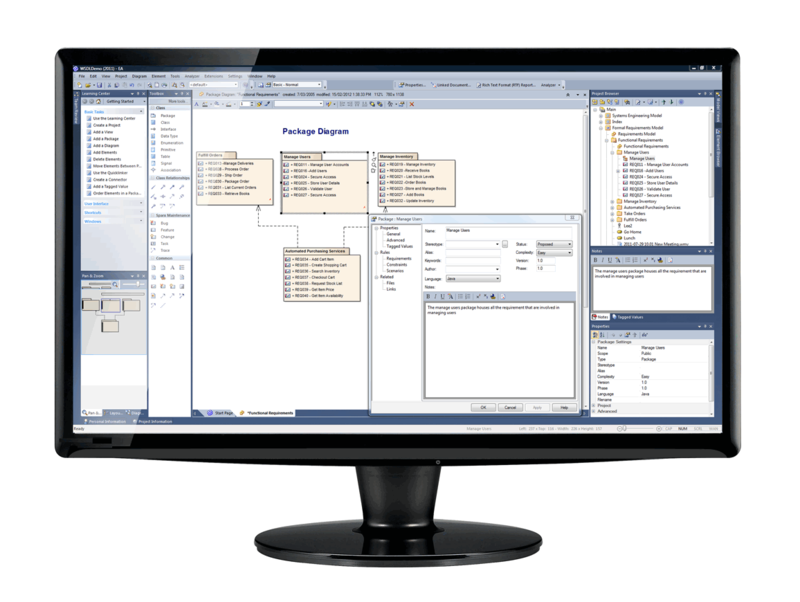 The Project Browser displays the model hierarchy of your project and facilitates adding, selecting, reorganizing or deleting packages, diagrams and elements. The Diagram Toolbox, which is context-sensitive to the diagram being edited, and provides an efficient means of creating appropriate model elements or connectors. Context menus provide options specific to the type of object and its environment. It is often useful to see multiple views simultaneously for comparisons, editing of related diagrams or referring to downstream representations of a given model. Enterprise Architect allows you to open several diagrams at once and dock these anywhere on screen. This means, for example, you can edit a diagram with all its related views immediately visible. Easily move or copy elements between open diagrams and can take advantage of large or multiple monitors. Maintain context and continuity between editing sessions simply by saving your window layouts and open views to a Working Set in Enterprise Architect. Enterprise Architect enables fast editing of element properties directly from the diagram. Using in-place edit commands, you can rapidly add and update element features such as attributes, operations and parameters, all without leaving the Diagram View. Rapid editing of diagram elements is further enhanced by numerous keyboard shortcuts for creating and connecting elements. Alternative Images can be superimposed on elements, to replace the standard image. Enterprise Architect ships with a number of predefined model and application patterns to assist in the creation of new projects and models. Each pattern contains useful notes, references and starter elements that together provide a framework on which you can build your model. For example, Enterprise Architect includes Java and .Net application patterns that get you started with a basic implementation model, generated code and appropriate scripts to build, run and debug your application. 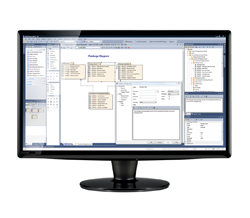 Model validation checks UML and SysML models against known rules from the specification, as well as any constraints defined within the model using the Object Constraint Language (OCL). You can perform model validation against a single UML element, a diagram or an entire package. The Model validation capability is therefore a powerful tool during your model review review process.